Glen Campbell died yesterday at 81, after many years' struggle with Alzheimer's. He had a fine, clear tenor voice, but his greatest talent was as a guitarist. Before going solo, he was part of the Wrecking Crew, a group of exceptional L.A. studio musicians whose contributions can be heard on many hits from the 1960s. You may (if you're as old as I am) recall that when Brian Wilson took ill during a Beach Boys tour, Glen filled in for him on bass (not his usual instrument) and high vocals (higher than his normal), to surprisingly good effect. Glen later couldn't resist adding a Beach Boys medley to his repertoire. In the clip below, please feel free to slide across his (I think) pedestrian covers of "Good Vibrations" and "California Girls" to get to 4:12, where the "Fun! Fun! Fun!" begins, and doesn't stop until the end. The backing band in the Beach Boys clip above is the Jeff Dayton Band, and the concert was at -- would you believe? -- the North Phoenix Baptist Church, in 1998. 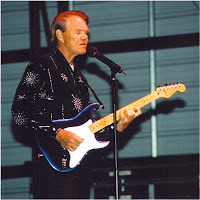 Glen Campbell photo via Wikimedia Commons.